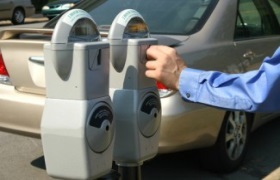 Some Robin Hooders in Keene, New Hampshire, who feed parking meters for cars in danger of getting tickets, are being sued by the city. The story says they are harassing the officers who monitor the meters, though this aspect of the story is in dispute. What is not in dispute, I don’t think, is this: if the people in Keene were merely saying critical things to the officers, but not feeding the meters and depriving the city of revenue, there would be no suit.